.... Work! Last week I was in Chicago visiting my sister and her family for 6 days (more on that later). When I got home, I was surprised to find a newly painted bedroom and bathroom in the "master suite" (if you can call it that, if you've seen my house you know what I mean!) I am only posting a picture of the bathroom right now because still need to finish decorating the bedroom. The bathroom used to be a bright-ish blue. I liked the color okay, it was getting a little old, but the biggest problem was the terrible paint job. I can't even explain how bad it was. It was like that 4 1/2 years ago when we moved in, and we just hadn't gotten around to fixing it. We had started talking about paint colors before I left but I didn't know he was planning to do it himself. He painted the yucky wood cabinet black, and the walls are a creamy-greyish-taupe, although they just look cream here, they do have color. I love the simplicity of it! If you know me very well you know my motto is "simple, yet elegant", and this fits the bill. Thanks honey, you done good! The flowers are from my rose bushes in the backyard. Aren't they gorgeous? I put them in the bathroom because I already had a huge boquet of roses from Ryan in the other room. Isn't he just the best?!!!! 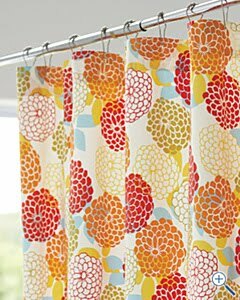 I just picked out this shower curtain last night from Garnet Hill. I like the bright colors, and I was getting tired of the stripes on my last one. I've had the last for like 8 years, it was time for a new one!